And in the 36th week, the PGA Tour rested. So how was your break? Not all that stress-free for the pros based in Florida, who spent at least a couple of days battening down the hatches and getting out ahead of Hurricane Irma, which at nearly 500 miles wide left no part of that state untouched in some fashion. That list would include world No.1 Dustin Johnson, reigning major champions Brooks Koepka and Justin Thomas and three others in the top 10 – Rory McIlroy, Henrik Stenson and Rickie Fowler. Don’t be surprised if a few are later arrivals at the BMW Championship, which tees up the final fortnight of the 2017 FedExCup playoffs. Johnson and Thomas are at the center of the chase for the $10 million season title, in fact, after winning the first two playoff events. The LPGA, meantime, heads overseas for the season’s final major at the Evian Championship outside Paris. That circuit’s hurricane headline has been of the feel-good nature, as Stacy Lewis pledged her entire winnings from Portland to Hurricane Harvey relief in her Houston hometown – then maxed it out by winning. Once again, we present a split edition of the weekly 10 top storylines. 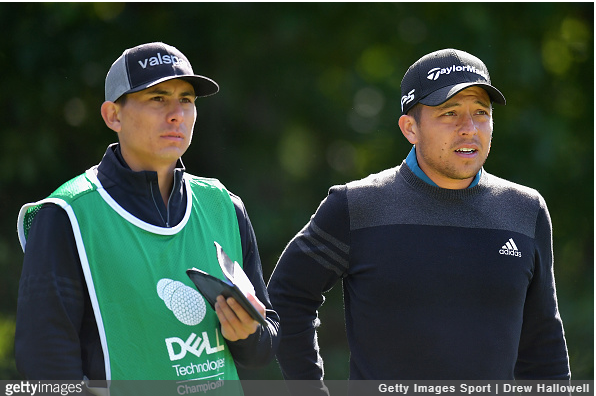 When last we looked in on the PGA Tour, Thomas was raising the trophy at the Dell Technologies Championship outside Boston – his fifth victory in a breakout season that includes his first major crown at the PGA Championship. A lock for Player of the Year, right? Not so fast. At the moment, Thomas isn’t even atop the list in FedExCup points. That distinction belongs to good buddy Jordan Spieth, who was runner-up both at TPC Boston and in The Northern Trust playoff opener. That gives him eight top-3 finishes in 2017, with a major among his three wins. If Spieth could win one of the final two events, his consistency might provide some sway in voting for the various POY awards – the PGA Tour’s Jack Nicklaus Award is a ballot of their peers, while the Golf Writers Association of America does its own balloting. If Spieth’s victory were to give him the FedExCup season title, that bonus might carry as much weight as any single tournament win. The best thing, perhaps, is we could be seeing the bloom of a friendly rivalry that already goes back to their junior days and has plenty of fruitful years ahead. Spieth and Thomas, separated by just 27 points, have locked down two of the five berths allowing players to capture the FedExCup without any outside help when the season finale hits Atlanta’s East Lake GC next week. Ditto for Johnson, courtesy of his victory at Glen Oaks Club three weekends ago. That leaves two more. Who’s next? One almost certainly will go to whoever wins this week at Conway Farms – anyone currently in the top 45 in points is likely to jump into the top five with a victory. 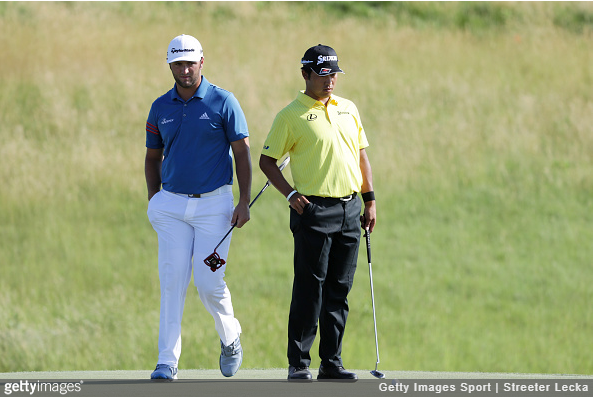 That leaves the final spot, where Hideki Matsuyama and Jon Rahm will be engaged in essentially a two-man battle for the berth. Matsuyama held the FedExCup points lead as recently as a month ago, but a missed cut in the playoffs opener and a tie for 23rd in Boston left him spinning his wheels. Rahm has the momentum, with top-5 finishes in both playoff events. A runner-up finish by Fowler, Marc Leishman, Paul Casey or Koepka also could thrust them into the mix. For more than half the field at Conway Farms, the FedExCup playoff journey will come to an end on Sunday. After dismissing 25 players at the first stop and 30 more at the second, we’ll be saying goodbye to 40 of the 70 men in the lineup. 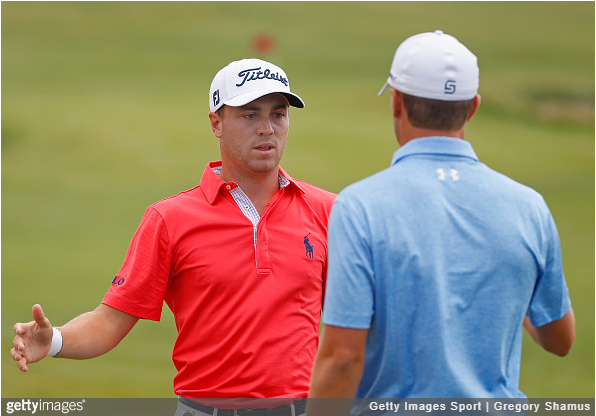 This week’s bubble foursome: No.29 Gary Woodland and 2011 FedExCup champion Bill Haas are in, No.31 Mackenzie Hughes and No.32 Xander Schauffele are out. Just 26 points separates that quartet. 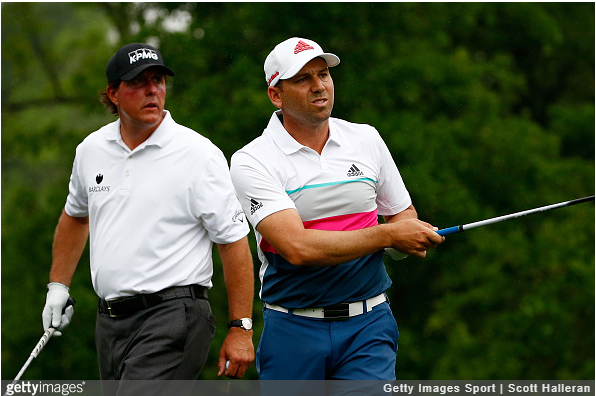 Two outsiders certain to get plenty of attention: Sergio Garcia and Phil Mickelson. Garcia is four spots off the cut line, 75 points behind Haas. The Masters champion hasn’t been to East Lake since 2014, though that’s largely his own doing – this is the third straight year he’s skipped the playoff opener. Mickelson needs an improvement of six spots in the standings. In each of the past two years, four men have played their way to East Lake after coming to the BMW Championship outside the cut line. Not that Mickelson ever really flies under the radar, but a couple of other factors will make him a focus at Conway Farms. The BMW marks his first start since being named to the U.S. Presidents Cup team, essentially given the final spot by captain Steve Stricker. It will be his 22nd consecutive year in either the Presidents Cup or Ryder Cup, after his closest near-miss. 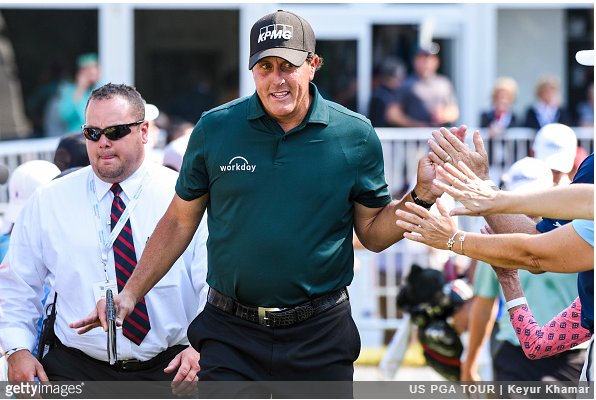 Mickelson was outside the top 15 in Presidents Cup points before a tie for sixth at TPC Boston. That was his highest finish since late March, when he reached the quarterfinals of the WGC Match Play. He has just two other top-10s in 2017. Mickelson also will make a bit of FedExCup history when he tees off Thursday, becoming the all-time leader in playoff starts with 41. He’s missed only two thus far, when he was ousted after two stages in 2014. Since the FedExCup playoffs began a decade ago, at least one PGA Tour rookie has made it all the way to the finale. 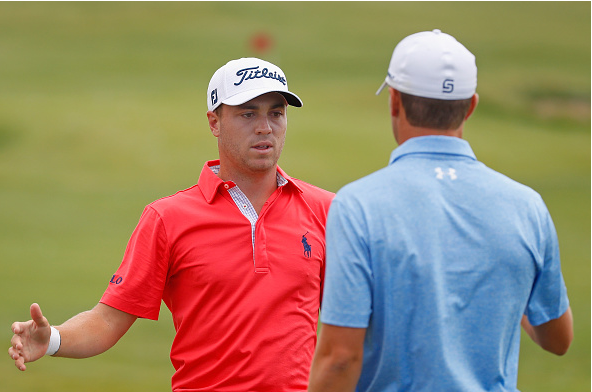 That streak is in jeopardy at Conway Farms – but with plenty of opportunity to rectify it. Hughes and Schauffele are the top rookies in the standings, both needing a solid week to extend their seasons all the way to East Lake. On the positive side, they only need to leapfrog one or two names to accomplish the task. The other good news is that Conway Farms features four other rookies, the most in history to reach the third stage. No.37 Wesley Bryan and No.41 Patrick Cantlay also have a reasonable chance to make it to East Lake with a good performance this week. It’s a bit more of a longshot for No.50 Ollie Schneiderjans and No.63 Grayson Murray. Korean pros have captured three of the LPGA’s first four majors in 2017, the third time this decade that segment has achieved that total. Never, though, have they been able to add a fourth to the list. They’ll get another chance at the Evian Championship, where Koreans have captured three of the past five titles. In Gee Chun is the defending champion. So Yeon Ryu began this year’s Korean run at the ANA Inspiration, beating Lexi Thompson in a playoff better known for a dubious four-stroke penalty costing Thompson a chance to win outright. Sung Hyun Park followed up at the U.S. Women’s Open, and I.K. 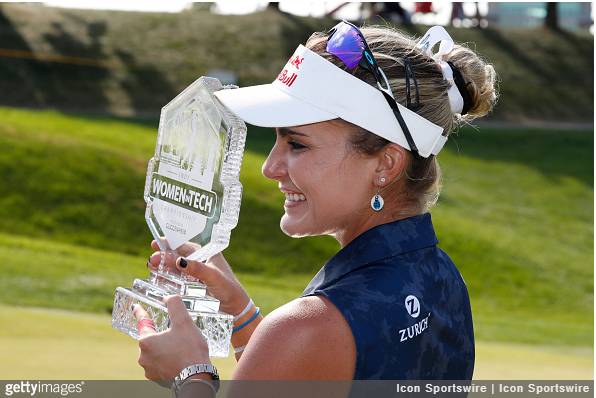 Kim made it three when she cruised at the Women’s British Open. Only American Danielle Kang’s win at the Women’s PGA Championship has prevented a Korean sweep. 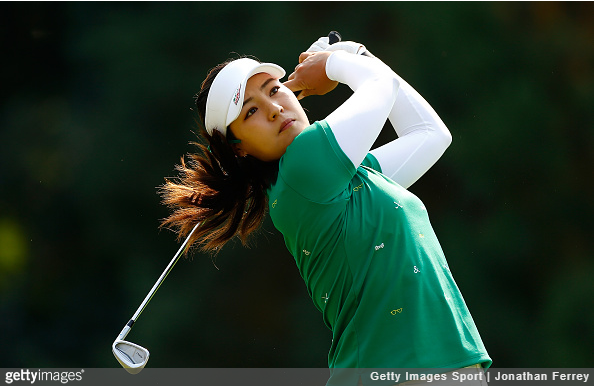 Ryu, Park, Chun, Kim and Hall of Famer Inbee Park make up half of the top 10 in the current women’s world rankings. As previously noted, Thompson should have been the LPGA’s first major winner of 2017 – undone by an arcane rule application from a sloppy marking process on the 17th green from a day earlier. Now the final major is at hand, and Thompson is still in pursuit of a second career major title. The encouraging news is the young Floridian will be carrying momentum to Paris, having captured last weekend’s stop in Indianapolis. It’s her second win of a star-crossed season in which she’s also dealt with minor health issues and her mother’s battle with cancer. In all, Thompson owns five top-2 finishes in 2017. And that doesn’t count her epic comeback from a 4-down deficit in Solheim Cup singles to earn a halve against European ace Anna Nordqvist. 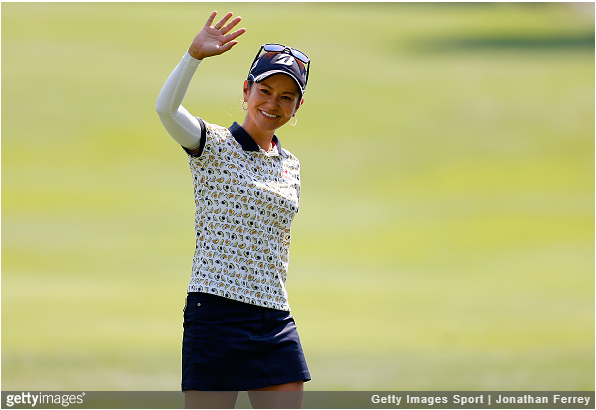 The Evian Championship will mark the final stop for Japan’s Ai Miyazato, a former world No.1 who has struggled in recent years and is ready to plunge herself into family life. Miyazato owns nine LPGA victories, including four in 2010 when she spent 11 weeks atop the world rankings. She’s been winless since 2012, though, when she triumphed in Arkansas. Her final start on U.S. soil came two weeks ago in Portland, where she took home a share of fifth. The Japanese star is a two-time Evian winner, coming in 2009 and ’11. With the LPGA’s best winging their way to France, it’s the last we’ll see of them on U.S. soil until the CME Group Tour Championship in November. And that could be up in the air, too, with the way Hurricane Irma rocked Southwest Florida area over the weekend. The Tour Championship has been contested in Naples for its past five editions. While damage is assessed and LPGA officials consider their options, the tour itself will jet from France to New Zealand and then into Asia for its annual six-week run on that continent in October and November. 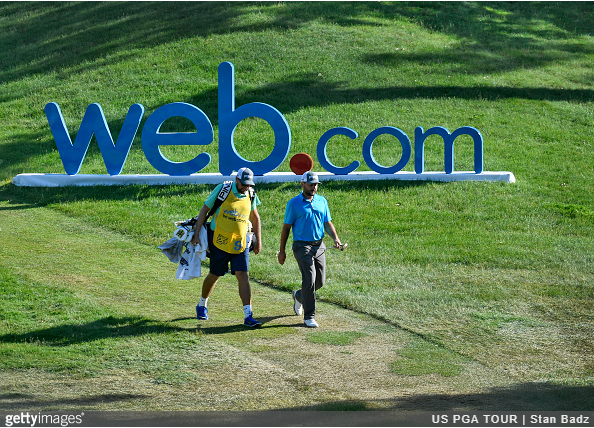 The Web.com Tour Finals also resumes its postseason following a week off – a curious scheduling decision considering it could have assumed some of the spotlight with the FedExCup playoffs also taking a breather. Be that as it may, the Finals head west for their second playoff stop at the Albertsons Boise Open. It’s one of four original events from what was then the Hogan Tour’s inaugural season in 1990, and has never been played anywhere than Hillcrest Country Club. Peter Uihlein, a Massachusetts native who has spent the past five years in Europe, tops a trio of players whose finish at the Finals opener locked up one of the final 25 PGA Tour cards to be handed out. Ryan Armour and Tom Lovelady also are secure. Previous articleCan Paul Casey Finally Close at BMW?